I am fortunate enough to be an advisor for the International Order of Rainbow for Girls (a Masonic Girls Organization). We recently had our state-level Christmas party and (because of the position I currently hold) I needed to have favors for the party. Me being me, I knew I wanted to make as many of them as I could. If you follow me on Facebook, Twitter, Instagram, Flickr, or Tumblr you might have gotten a glimpse of what I made for this event. 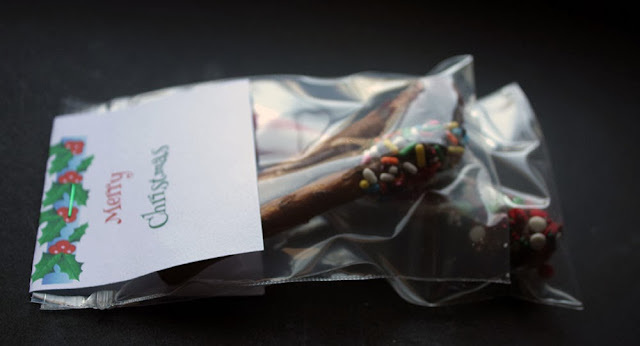 I combined the dipped peppermint sticks with several other fun items to make goodie bags. 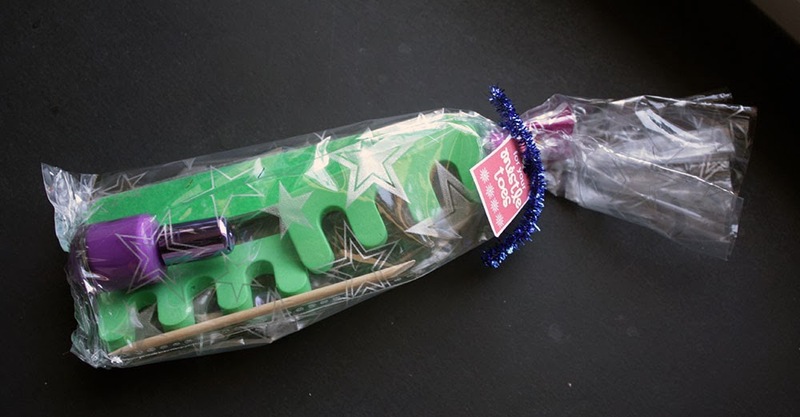 The bags are simply closed with Christmas washi tape. In each baggie were two zip-top jewelry bags. One bag contained two chocolate-dipped, sprinkle coated pretzels and the other held one of the peppermint sticks. 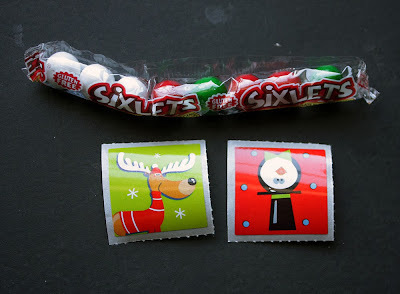 The Merry Christmas labels were printed onto cardstock and attached to the baggies with a staple. 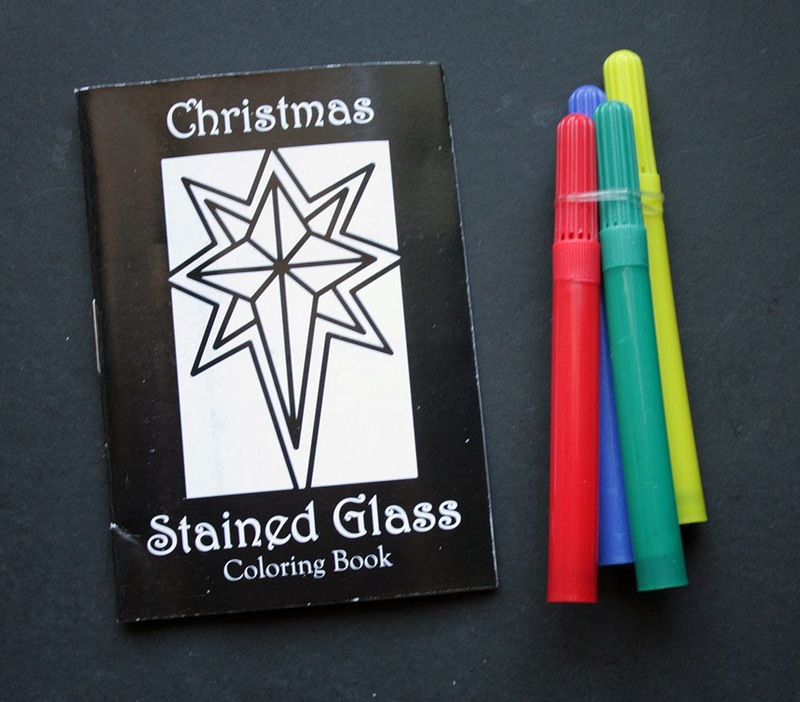 These tiny stained glass coloring books and markers from Oriental Trading Company were also included in the bags. I wanted to be sure to give each of the girls that attended a little something special as well, so I made up another set of little baggies as pedicure kits. They're just a small bottle of nail polish and a set of pedicure tools, but the label is what makes it for me. 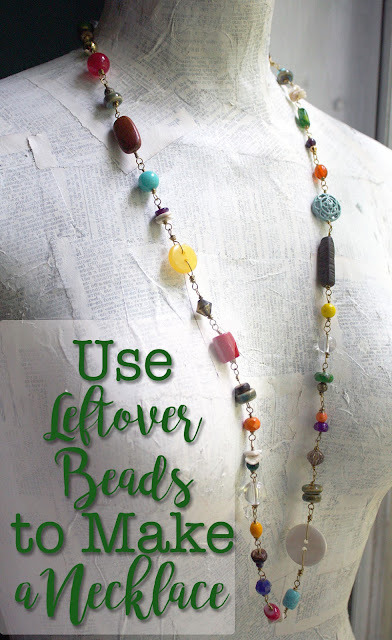 I found the "For Your MistleTOES" labels via The Crafting Chicks. Favors were also made for the devotional breakfast. 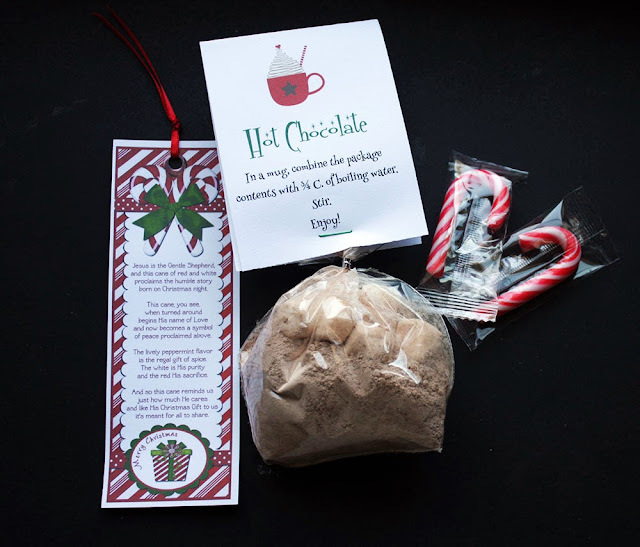 This time I went a little more simple with baggies of homemade hot cocoa mix (with marshmallows), a printed Candy Cane Legend bookmark, and some candy canes. I also read some information about the Candy Cane Legend to the girls. It's a legend that I just really love so I thought I'd share with you what I shared with them. **The hooked shape is a symbol of a shepherd’s hook to remind us that Jesus is our shepherd and we are his flock. When turned upside down, the cane becomes a “J” for Jesus’ name. 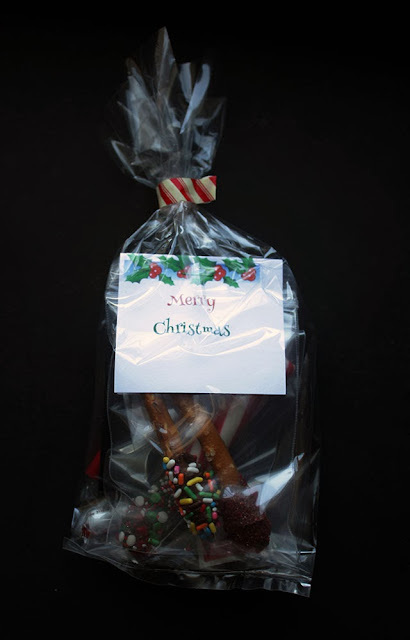 **It is a hard candy to remind us that Jesus is the rock of our salvation. 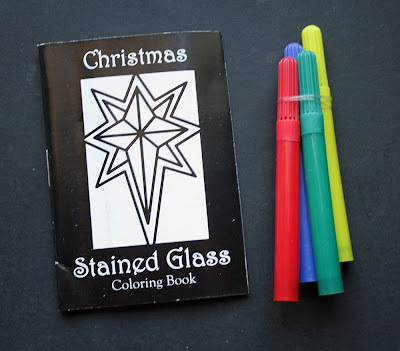 **It begins as a pure white to represent the virgin birth and the sinless nature of Jesus. **The stripes on the candy cane also have meaning. Most often, the candy has one main stripe and three smaller ones. The large one represents the blood shed on the cross for our sins. And the smaller three are the trinity of Father, Son, and Holy Ghost. **Even the flavor of the candy is symbolic. The peppermint is similar to Hyssop which was used for purification and sacrifice just as Jesus sacrificed His life for ours. 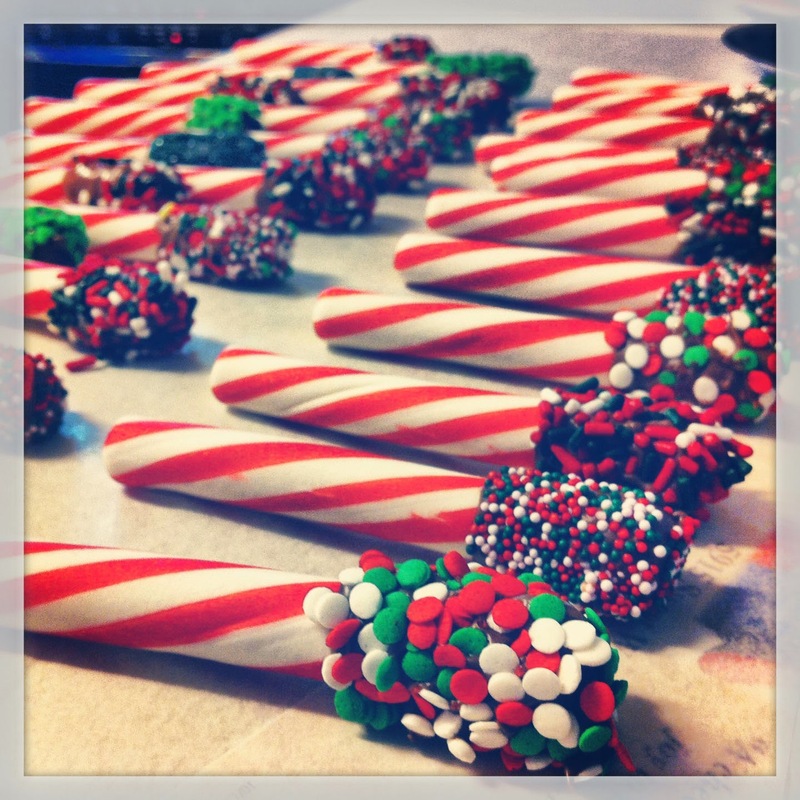 Unfortunately over time the real story of the Candy cane has been hard to find and its meaning all but lost in the busy-ness of the season. It has become nothing more than a piece of candy. However, you now know what it truly means and can share it with others. For when you share a piece of a candy cane, you are sharing Jesus with a friend. I'm not positive I'll have time to post again before Christmas, so let me go ahead and wish you a most magical and blessed Holiday however you choose to celebrate it! Those gift bags look great! I bet that the party was a lot of fun.